A Shower, or Any Port in a Storm, S.W. Fores, 1786, British Museum. A popular subject of satirical artwork in the eighteenth century was women's fashion. I've never touched on it in this blog, as we deal specifically with a profession that was exclusively male at the time. 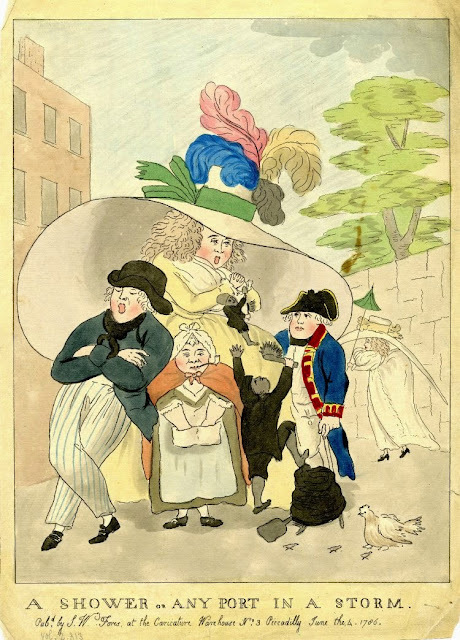 Here, however, we find Jack Tar taking shelter under the humorously wide hat of a lady. Joining him is an old woman, an officer (possibly of the Royal Artillery), a hen and her chicks, and some large globular object that I can't identify. Our yawning mariner wears a blue jacket that ends at the top of the thigh with a black neckcloth and trousers with narrow blue vertical stripes, and a round hat with an upturned brim.